Harley Davidson is falling after reporting earnings well under analysts’ expectations. The future isn’t too bright either, as the company said it expects sales to continue to decline. Watch the stock move in real time here. 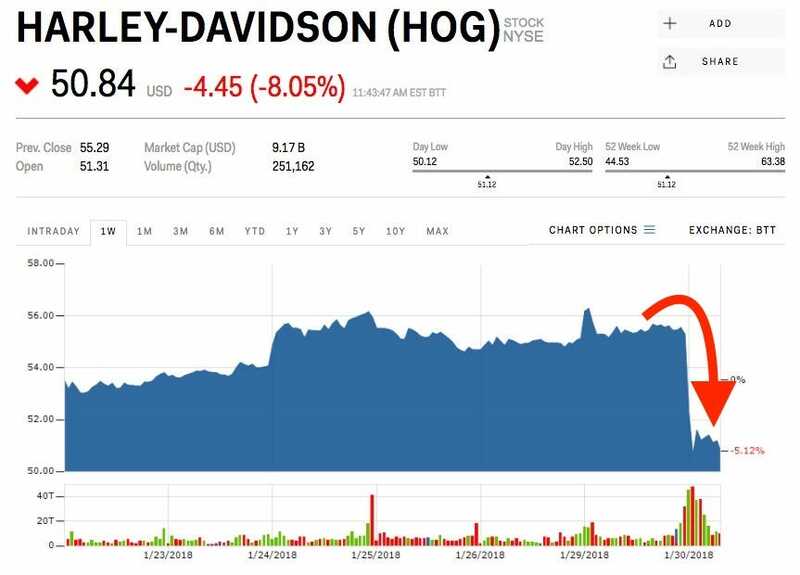 Harley Davison shares are plummeting on Tuesday after the company reported earnings well under analysts’ expectations. Shares are down 8.54% to $50.57 after the company reported its fourth-quarter earnings. The motorcycle maker reported earnings of $0.05 vs estimates of $0.45. Harley brought in revenue of $1.05 billion vs estimates of $1.01 billion and shipped about 47,200 bikes during the quarter.